After the glorious weather of April and May, the month of June became more unsettled with periods of heavy rain and strong winds. However, this did not deter our site volunteers who pressed on with an impressive amount of fieldwork. The following entries provide a brief description of what we have been doing on site. Trench 19 is our largest trench to be opened on site, investigating geophysical anomalies, the nature and extent of the burnt mound, and looking in general at one area of the site that would have been suitable for the building of structures. 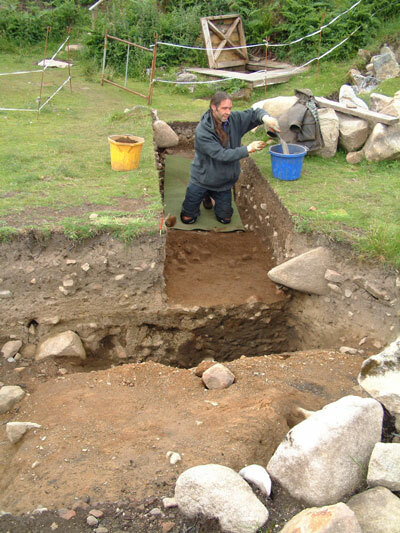 The image above shows Sheila Duthie, Dawn Ogston, Jennifer Graham and Siobhan Peters, excavating through bracken roots and the top of the burnt mound deposits in Trench 19. 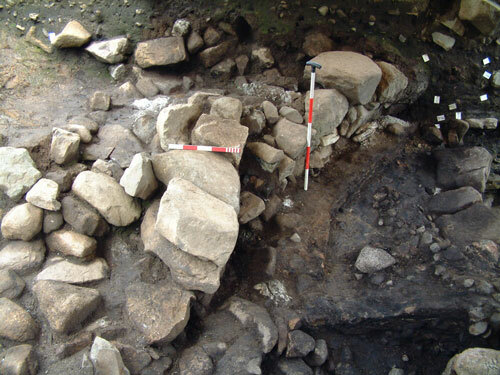 The boulder wall visible in the image is a late feature within the history of the site, most likely dating to the Post-Medieval period. 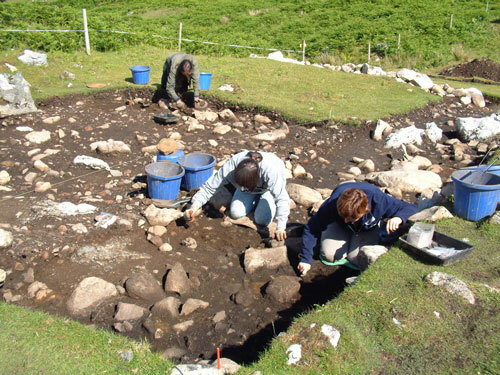 The image below shows Sheila Young and Christine Yule at work in the southeast sector of the trench. This area produced metalworking residues, a glass bead, a possible Roman coin and stone tools in the upper mixed deposits above the burnt mound deposits. However, the upper burnt mound deposits produced few small finds. 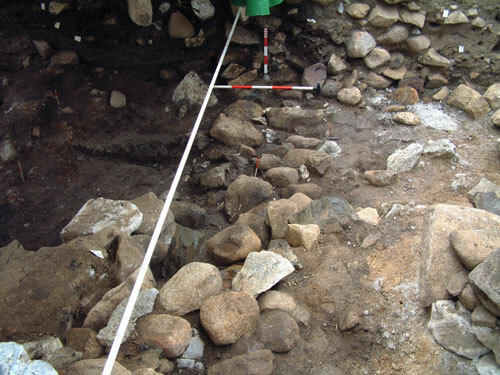 The displaced stonework adjacent to the scale (1 metre), is possibly the remains of a simple revetment wall to contain the burnt mound deposits. The structure of the burnt mound in this area of the site is quite unusual. The image below shows the southeast sector of Trench 19 (scales = 2m and 1m), looking from the northwest. The fire-cracked stone deposits can be seen in this image within the dark-coloured sediments, that are charcoal and ash-rich. 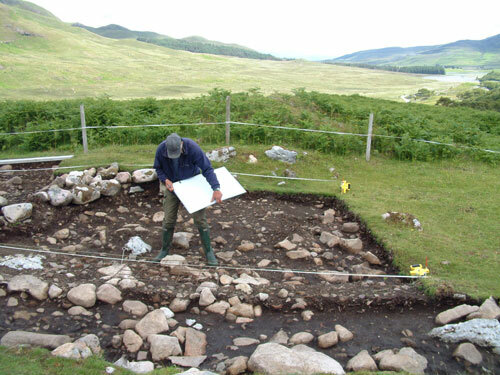 However, within the burnt mound deposits we are uncovering a significant number of larger granite and limestone rocks and boulders, most of which have not been affected by heat. At the moment none of these stone clasts appear to represent any type of structure, although this may change as the excavations progress. It has also proved difficult to recognise any distinctive stratigraphic layering within the burnt mound deposits, so we have been excavating the deposits in ‘spits’. This allows us to retain some element of control with regards to any material recovered from the burnt mound such as charcoal, burnt bone or small finds - the former allowing us to submit samples for identification and radiocarbon dating. During the excavation of other trenches in the burnt mound, this methodology has allowed us to extract well-defined chronological horizons within the deposition of these deposits. The surfaces exposed through excavation are recorded in plan at regular intervals, both through detailed drawing and photography. The image above shows Martin Wildgoose drawing in Trench 19. We have now removed a significant amount of material from Trench 19, during which we have recovered several coarse stone tools including pounders and grinders (some of which have been subsequently burnt in a fire) and the odd degraded sherd of Iron Age pottery. 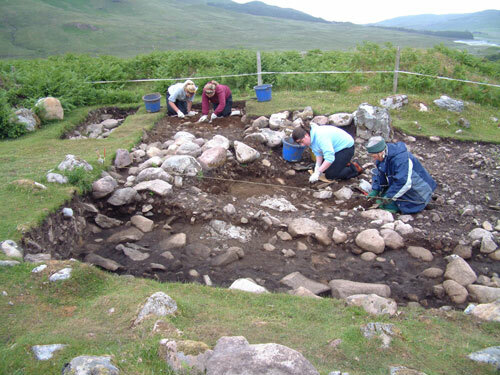 The image below shows Nicola McGaughey, Catriona Graham and Billy MacRae, excavating in Trench 19. On the last day of her two weeks of volunteering on site, Nicola recovered a fine spindle whorl from Trench 19 manufactured from soapstone. Details of this find will be posted on the ‘Finds Page’ soon. This extension to Trench 14 was located to investigate the extent of the burnt mound and associated features in the southern sector of the site, adjacent to the caver’s entrance. We know from working at the site that this area can flood and become water-logged during periods of heavy and sustained rainfall. Revetment walls exposed in Trench 15 and 14 may have been constructed during the Middle Iron Age to control flooding in this area, attempting to stop the water from entering the area immediately outside the stairwell entrance to Bone Passage where we have uncovered a succession of large fire-places. The image above shows Billy MacRae excavating in Trench 14, removing the upper layer of soils and silts that overlie the upper burnt mound. 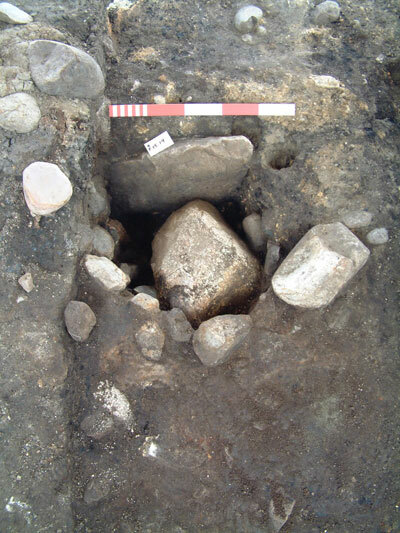 A thin, but compact layer of fire-cracked stone was uncovered over the full surface of the trench, although this produced few finds with the exception of two cobble tools. 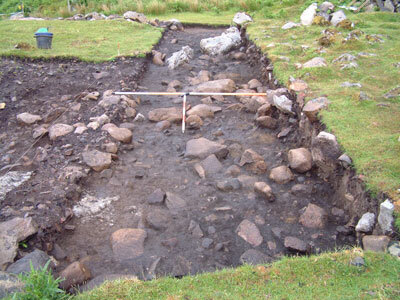 The image below shows the surface of the upper burnt mound after excavation. This view is looking southwest towards the caver’s entrance (scales = 1m and 0.5m), after the revetment wall had been removed from the trench (at far end of the trench). Below the revetment wall, the deposits of fire-cracked stone increased in thickness and charcoal-rich deposits were sampled. 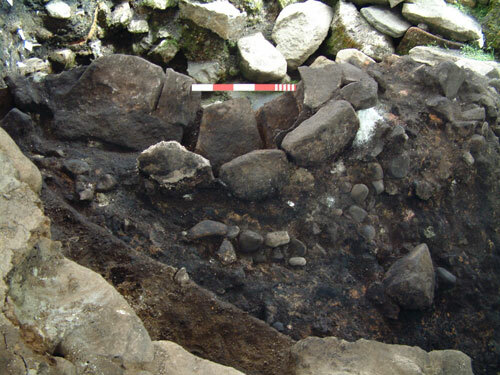 Removal of the layer of fire-cracked stone revealed a thin deposit rich in charcoal and peat-ash, which also covered most of the trench surface. The image below shows this surface, which may be the result of residues washing off the slopes of the burnt mound to the north and settling within this part of the site. We still have at least 0.5 metres depth of archaeological deposits to remove in this trench before we reach the natural clay below. With a return to wetter conditions on site and water once again filling the dam in the stream, we were able to resume excavations in the cave (Bone Passage). 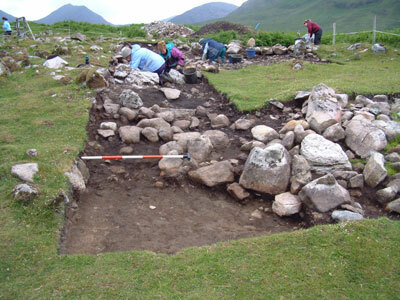 We now have something of a deadline to meet with regards to finishing the excavations in Bone Passage. In late August of this year, AOC Archaeology Ltd will be carrying out detailed laser scanning work to record the stairwell, Bone Passage and a section of the main stream passage beyond, in 3D. This will hopefully result in survey data to show the true complexities of this part of the site; data that we hope to make available on this web site. We have started to remove the last of the archaeological deposits in Bone Passage, adjacent to a small flowstone grotto. The upper deposits have been found to be rich in animal bone including pig, red deer and cattle, while small finds include sherds of pottery and small iron concretions that will be submmited for x-ray analysis. Fragments of red deer antler are also numerous at this end of the passage. A compact layer of cobbles, including fire-cracked pebbles, has now been reached - a continuation of a cobbled floor identified in a adjacent trench in the passage last year. Above the floor we have recovered a significant quantity of periwinkles (shellfish), some of which have been crushed in prehistory through the passage of feet. The image above shows Dawn Ogston, Jennifer Graham and Siobhan Peters (all studying archaeology at the University of Edinburgh) having a go at wet-sieving archaeological deposits from Bone Passage. Further details regarding our excavations in Bone Passage will appear in the next news update. Elsewhere, work has been moving on nicely in Trench 15. In the last news update I mentioned that we were in the process of removing the drystone wall uncovered in the Trench, which was threatening to collapse if we removed additional material from around it. The image below shows the wall before removal. The image below shows the east side of the trench after the removal of the wall (scales = 1m and 0.5m). The foundation stones can still be seen, while the wall appears to have been built on a layer of large granite and limestone boulders. 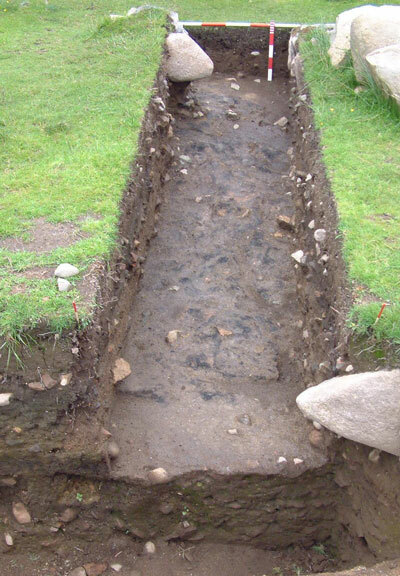 During the removal of ash deposits to the north of the wall foundations a pit-like feature was uncovered, comprising an upright slab of stone and smaller side slabs, with a burnt granite boulder inside! No other finds were recovered from the feature, so this remains something of an enigma. 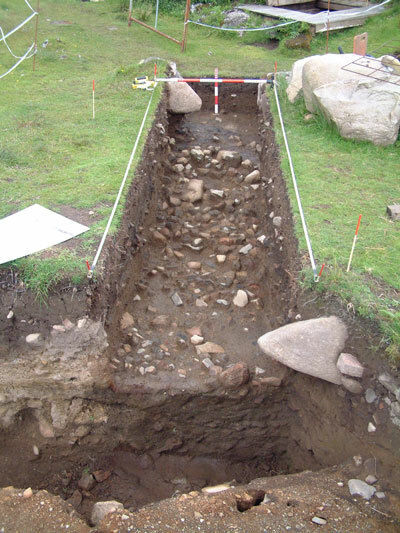 To the west of the pit feature, a large hearth comprising granite slabs was revealed (see image below - scale=0.5m). 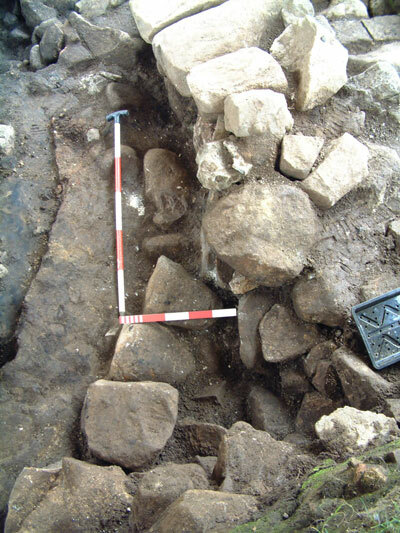 The hearth, which was partially excavated in the adjoining Trench 2 in 2005, has a stone curb and is surrounded by deposits of fire-cracked pebbles. During excavation of the ash layers surounding the hearth, Sheila Young recovered a fine spindle whorl manufactured from soapstone, adding to the collection of these objects recovered from around the hearth settings outside the cave and from within Bone Passage. What was so special about these objects and their deposition at High Pastures? The discovery of the spindle whorl by Sheila was to be bettered the following week by Christine Yule, while excavating in the same location. Christine recovered two soapstone spindle whorls in a short space of time, adding further to our growing collection!! Images and further details relating to these finds will be posted on the ‘Finds Page’ soon. Work in Trench 15 has now progressed onto the investigation and dismantling of the drystone wall on the western side of the trench. The image below shows this section of the wall after removal of clay capping material (scale = 1m). Some of the stones are quite large and proved heavy to move manually! The image below shows the wall after removal of the capping material from the northeast (scales = 1m and 0.5m). 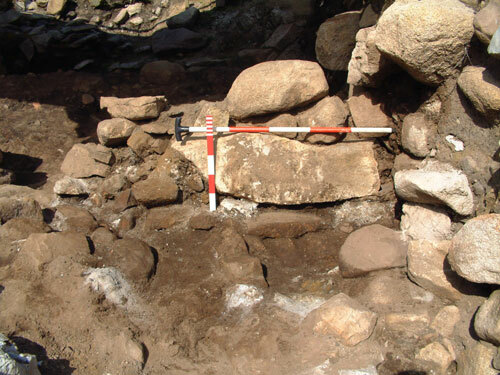 The slab-built hearth setting is to the right in the image and the lean on the wall face can be clearly seen, caused by subsidence within the deposits below the wall footings. 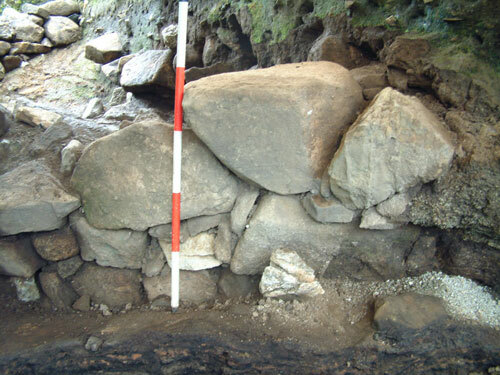 During removal of the ash layers at the base of the outer face of the wall it appeared that we may have uncovered a second wall (see the kink in the alignment of the wall and the narrowing ‘fillet’ of stonework running towards the camera position). This can be seen more clearly in the image below, taken from above (scales = 1m and 0.5m). Further work would obviously be necessary to unravel this anomaly, so visit the news page again soon to get all of the latest developments from Trench 15 and the other trenches on site.